Navajo Storm Pattern Rugs for Sale! Our entire online selection of Navajo Weavings with a ‘Storm Pattern’ design. The Storm Pattern Rug is easily recognized by its main design elements, but can have numerous variations and can be woven in an unlimited variety of colors. It is one of the few Navajo rugs that tells a story. The Navajo Storm Pattern Rug is one of the most popular Navajo rug designs that, in most ways, resulted from J.B. Moore’s work at the Crystal Trading Post. Most evidence tells us that the Storm Pattern was actually born at or near Crystal, but J.B. Moore most certainly developed & promoted this style into the popular rug design it is today. The Navajo Storm Pattern Rug is identified by its main design elements. Generally speaking, the more commonly understood meanings of these main design elements can be easily described. A rectangle in the center of the rug represents the center of the storm. There are zig-zag lines, representing lightning bolts, flowing from the center of the storm out to smaller rectangles in each of the four corners of the rug. The rectangles in each of the rug’s corners usually represent the four sacred mountains of the Navajo. To some, these corner rectangles can alternatively represent the four directions, or the four winds, etc. At the outside of the storm design, between two of the corners, there is usually a waterbug, along with his companion, the snowflake. Usually, some form of the sacred arrow is portrayed on the sides of the rug. Some have suggested that the Navajo Storm Pattern Rug is a regional style of Navajo weaving which originated in the Western part of the reservation near Tuba City and Kayenta, and THEN was later promoted and solidified by J.B. Moore and the weavers at Crystal. Although disputed by most experts and contradictory to most available evidence, the theory that the Storm Pattern rug originated in the Western region is still an interesting one worth noting. This theory of the meaning of the Storm Pattern Weaving’s design relates to Navajo mythology, and that man and all living things came to earth from the underworld through the Lake of Emergence. According to this theory, the Lake of Emergence is symbolized on a rug by the central square of the Storm Pattern. 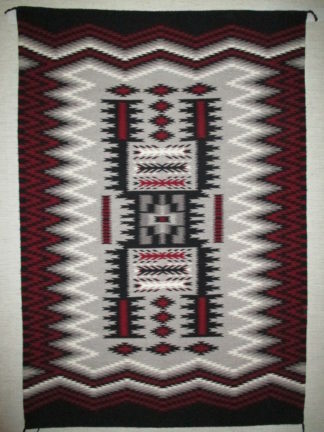 The squares in the four corners of the rug represent the Navajos’ four sacred peaks: the San Francisco Peaks in Arizona, Mt. Taylor in New Mexico, and Mt. Hesperus and Sierra Blanca in Colorado. Here, the connecting zigzag lines are lightning bolts which carry blessings back and forth between the mountaintops, bestowing good spirits on the weaver and her household. The variety of interpretations of the Storm Pattern Rug suggests that meanings could possibly have been assigned, or at least slightly modified, by traders and collectors rather than by the Navajo weavers themselves. The Navajo Storm Pattern Rug’s precise origin is quite clearly… unclear… but J.B. Moore and the talented Navajo weavers at Crystal developed this design into one of the most popular of the Navajo rug patterns.